The Spirit XT600 treadmill is another fine machine from Spirit treadmills, showing their commitment to quality, durability, and effectiveness for the user. UPDATE: The Spirit XT600 has been discontinued. You can compare popular Spirit Treadmills at Amazon to find one of the current models that suits your needs. Because the Spirit XT600 treadmill comes with the Spirit name, most experts agree that this has to be another fine offering in a treadmill. The high powered motor allows everyone from the beginner to the experienced exerciser the ability to start off slowly, but then advance as their fitness increases. The running surface is large enough for any number of running and walking strides, while the speed and incline offer many levels of intensity along with the built in programs for workouts. 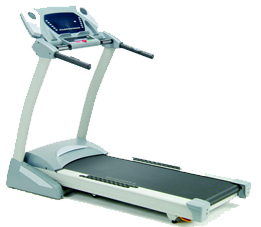 Trainers like the high user weight capacity, making the Spirit XT600 a treadmill that can be used by just about anybody. Gadgets abound on Spirit treadmills, but not in an overwhelming way. Users like the wireless chest strap which allows them to easily monitor their intensity levels without distraction. The XT 600’s pulse grip heart rate monitor works well for those who like to hold onto something while they move. Testers find the overall movement of the treadmill running surface to be stable and even. The updated frame of the Spirit XT600 is obvious as it almost seems that you are running on pavement (but with less impact) when you close your eyes for a moment. 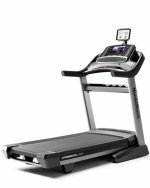 Consumers appreciate the warranty on the Spirit XT600, which is one of the best in the business, though Spirit’s commitment to quality generally does not necessitate treadmill repairs until long into the ownership time. Spirit treadmills are a great combination of function, form, and style. They look great and offer you everything you could want and need from a treadmill. While the Spirit XT600 treadmill comes with a hefty price tag ($1899) it’s well worth the investment. This is a treadmill that not only allows you to start an exercise program, but also allows you to grow in your fitness level over time.